Life is full of lessons; those who learn from those lessons continue to grow. Business is the same way. A business needs to identify the success and failures of its projects, so that it can learn from those lessons and grow. By keeping track of successes and failures in different projects; a business is able to continuously adjust its strategy to ensure greater success. The Microsoft Lessons Learned Checklist template is a great way to do this. Using this template, you are not only able to see the project’s status, but you are also able to identify areas that are on target and areas that need improvement. This template is not only easy to download, but it is fully customizable. You can download the template for free right here. First, fill in the name of the project that is being implemented, along with the departments that are being utilized, and the products or the service that is being used. Second, break down the project or plan into three or four categories; dependent on the size and type of the project. This may include the type of staff being used, resources, technology, or any other category that helps to identify the steps. Third, for each category, decide what procedures are required in that department, in order to make the plan a success. Finally, as the work is completed, fill in the fields that assess the progress of each category; and use this information as a Lessons Learned Checklist upon which to redesign and improve on the next project. The best way to use this template is to refer to it on a regular basis. Why wait till the project is finished to find all of the flaws; when a continuous check on progress, can help you to readjust and increase the potential for success in all areas of the project. Second, save all of the data so that as you look back over the project, and get a clear picture of how things changed with each adjustment. 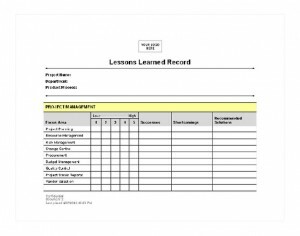 Finally, Lessons Learned Checklist can be used for more than just special projects. It can also be a great tool for employees to track their personal progress and adjust their work accordingly for greater success.